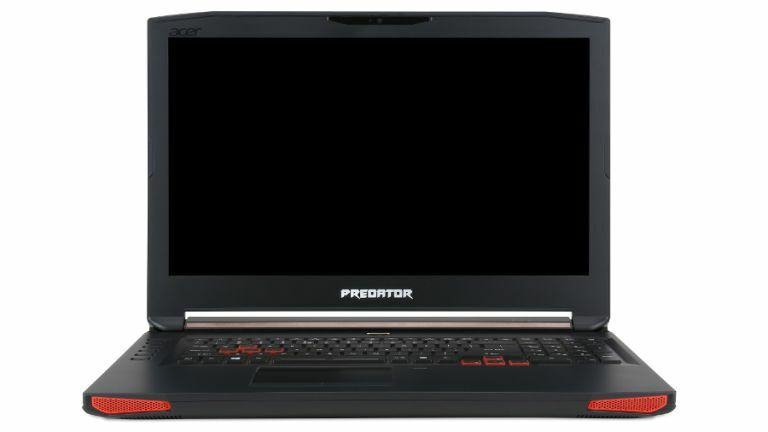 Acer has updated its long-running Predator gaming range, with a cluster of new launches revealed over at the IFA show in Berlin, including laptops, desktop PCs and monitors. So let's start with the notebooks, which are the Predator 15 and Predator 17, driven by Core i7 6700HQ processors which are from Intel's new Skylake range. These can be specified with up to 32GB of DDR4 RAM, and up to 512GB PCIe SSDs, with some models boasting GeForce GTX980 graphics solutions for fast mobile gaming. Both the 15.6-inch and 17.3-inch laptops offer a full HD display, with the option of a 4K display (3840 x 2160) on the former. Other interesting additions include a FrostCore fan module which can be inserted into the optical drive bay to help with extra cooling for demanding gamers, along with DustDefender, a dual fan system with reverse rotation to help remove any dust build-up in the laptop. Moving on to the desktop machines, these are the Predator G6 and G3 PCs which boast the usual funky looking case (an “intimidating armour-covered design” as Acer describes it), again complete with Intel Skylake processors. There's more innovation on the cooling front here with both machines making use of Acer IceTunnel technology for optimised airflow inside the case to ensure better dissipation of heat, and the G6 offers a one-touch overclocking system where the user simply presses a button to ramp performance up. Acer also unveiled a new dedicated 8-inch Android gaming tablet with a resolution of 1920 x 1200. The Predator 8 is powered by an Intel Atom x7 CPU, and has up to 64GB of storage (with a microSD slot for further expansion). It's also thin and light at 8.7mm and 350g respectively. The display is an IPS panel with Acer's ColorBlast technology for high-quality colours, and this visual finery will be matched on the sonic side with an array of four front-facing speakers capable of virtual surround sound. Finally, Acer showed off some new monitors, the Predator Z35 and Predator XB1 range, both of which have Nvidia's G-Sync technology on board to combat stuttering and tearing for a more fluid gaming experience. The Z35 is a curved 35-inch monitor with a 21:9 aspect ratio and a resolution of 2560 x 1080, and Acer says it can be overclocked to a refresh rate of 200Hz. It also boasts 'ultra low motion blur' (ULMB) tech, which as the name suggests helps reduce any blurring in shooters and other fast-moving games. As for the Predator XB1, that comes in three flavours. There are two 27-inch models, with the XB271HK having a 3840 x 2160 resolution IPS panel with a 60Hz refresh rate, whereas the XB271HU offers a 2560 x 1440 resolution but with a faster refresh rate of up to 144Hz, and the aforementioned ULMB technology. There's also a 28-inch variant of the XB1 which boasts a 4K resolution and a swift 1ms response time. The Predator 8 tablet is due to land in Europe in October starting at €349 (around £250), with the Predator notebooks hitting shelves in November with prices starting at €1599 (around £1170). As for the monitors, the XB1 range will arrive in October starting at €699 (around £510), and will be followed by the Z35 which will be on sale in December starting at €1099 (around £800).